Scene75 is extremely excited to announce a brand new attraction -Valkyrie! 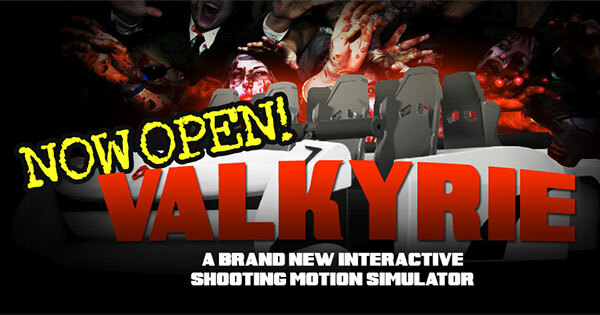 Valkyrie is an interactive shooting 4D motion simulator with seating for up to 8 people. In the simulator, passengers will go on an intense first person shooting journey through a zombie infested military base. Players will even be able to choose from 2 different perspectives on the dual screen display while trying to recover secret research files and still make it out of the base uninfected. Valkyrie riders will be equipped with a pair of 4D glasses and an arcade gun in order to help them battle the upcoming horde of zombies that they are about to face. In order to make the experience even more thrilling; the ride’s motion and on screen story are enhanced by wind and strobe effects. Each seat has dedicated fan settings to ensure that all players have the same immersive experience. After the 5 minute zombie shooting mission ends riders will be shown their individualized final scores on the screen and determine if the mission was successful. Here at Scene75, we are always looking to add more excitement and fun to our guest experience. After experiencing Valkyrie first hand at the International Association of Amusement Parks and Attractions Expo in Orlando, FL we knew that our community and fans at Scene75 would love it. As an added bonus, we are happy to claim that Scene75 is the very first location to have Valkyrie in all of North America. Valkyrie is designed and created by Simuline, who is also the manufacturer of Scene75’s current 4D theatres. This new 4D simulator features a dual haptic hand held gun for each rider in addition to the immersive 6DOF motion platform and Simuline’s award winning Unreal game engine. For more information about the simulator features please contact Simuline directly through www.simuline.com. We hope to see you here this summer to experience this awesome new attraction for yourself! To stay up to date with all Scene75 improvements and updates, please follow us on Facebook and also check out our website at www.Scene75.com.